HostForLIFE.eu supports mojoPortal 2.6 hosting on our latest Windows Server and this service is available to all mojoPortal 2.6 as our CMS (Content Management System) application of choice. 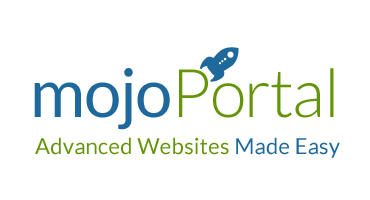 Choose to use mojoPortal 2.6 as the for your web solution and you won't regret it. mojoPortal 2.6 is a popular and well-respected open source web Content Management System (CMS) that is freely available and is backed up by a great project team. What is European mojoPortal 2.6 Hosting? mojoPortal is a free open source content management system. Anyone can use mojoPortal to build a website, no coding knowledge is required. mojoPortal is an open source, cross-platform, content management system (CMS) for ASP.NET which is written in the C# programming language. The CMS supports plugins and has built-in support for, among others, forums, blogs, event calendars, photo galleries, and an e-commerce feature. Why Choose HostForLIFE.eu for mojoPortal 2.6 Hosting? Try our Free mojoPortal 2.6 Hosting today and your account will be setup soon! You can also take advantage of our Windows & ASP.NET Hosting support with Unlimited Domain, Unlimited Bandwidth, Unlimited Disk Space, etc. You will not be charged a cent for trying our service for the next 3 days. Once your trial period is complete, you decide whether you'd like to continue.